My latest recording is now out. It is a collaboration with my talented Son Aaron Ord who plays Celtic harp and percussion. 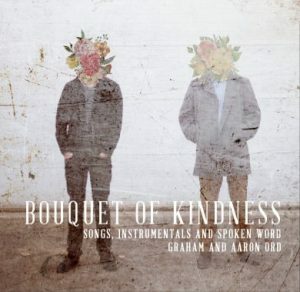 Bouquet of Kindness is a collection of original songs, instrumentals and spoken word. It is a beautifully recorded CD which was recorded at the Bottega Studios in Kelowna BC. Our approach was to create a recording that is similar to how we sound live, so we avoided the temptation to do many overdubs and keep it minimalist and stripped down. It has a peaceful feel but it is far from just background ‘Musak’. The pieces are dynamic and thoughtful and take the listener on a journey of creative expression. Bouquet of Kindness is available as hardcopy or as a digital download at Knewsense Records. We are also proud to partner with Milkcrate Records in Kelowna, who are selling it for us from their commercial Record Store. We are currently working on some live shows which will be announced very soon. We hope you enjoy the new music. Joy Has Come to our Home from the new CD Bouquet of Kindness. We are currently working on some live show dates which will be announced very soon. We hope you enjoy the new music. The CD is available from the link below. Please specify if you want to purchase a hard copy or just a download.